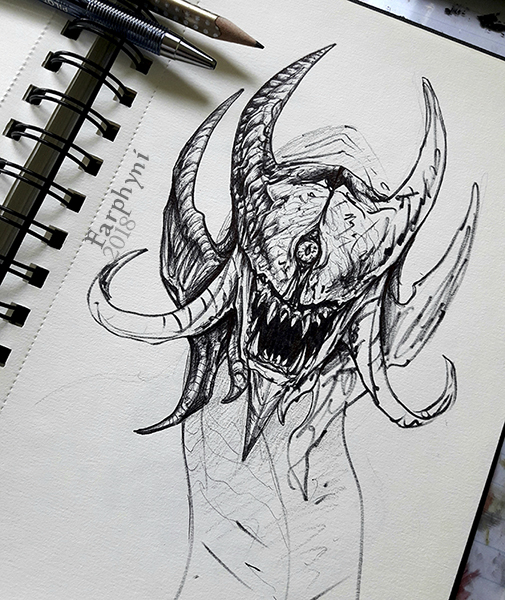 The sketch shows an abyssworm. Wanderers encounter them all around the world (canyons, caves, etc…), as those creatures are very adaptable to different temperatures. Once spotted, people run away from them, as abyssworms can grow quite big and looks rather scary. It is also told, that you’ll get absorbed by the abyss when eaten and your soul won’t be able to reincarnate. Abyssworms are a related species to the Djallthari, but live on land and not in water. They grow very, very slow and need ages to get big. Usally they get killed soon and therefore there are only very few huge abyssworms, which are very feared, even though they are not seen so often.